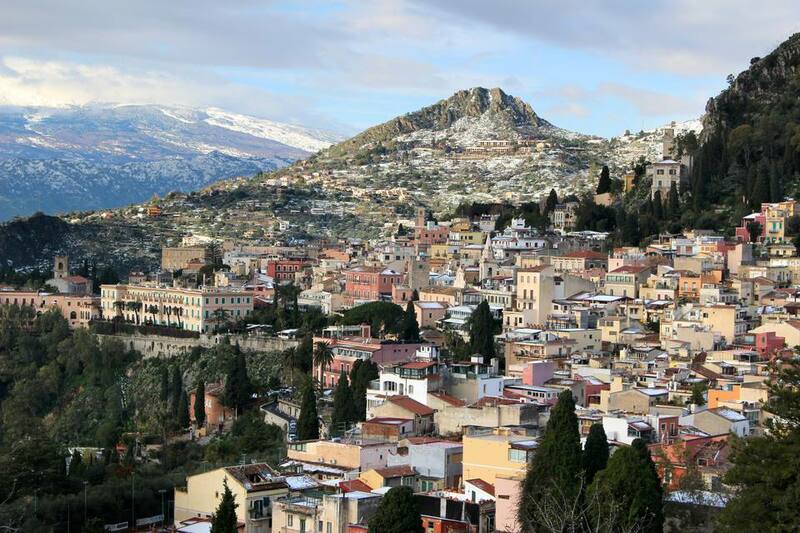 Taormina is a popular resort town in Sicily with many interesting sights and attractions. Taormina has remnants of its Greek and Roman past, a medieval quarter and castle ruins, and modern shops and restaurants. Perched on the side of Monte Tauro, the town offers fantastic views of the coast and the Mount Etna volcano as well as good hiking paths. Near the town are excellent beaches where you can swim in the clear sea water. Greek Theater: Taormina's Greek theater was built in the third century B.C., renovated by the Romans, and is now used for summer performances. The theater, built into the hillside, has excellent acoustics and spectacular views of the sea and Mount Etna. Medieval Quarter: A clock tower gate serves as the starting point for Taormina's picturesque medieval section with its narrow streets and old shops now selling modern clothing, crafts, and souvenirs. Corso Umberto: The lively main street through town, Corso Umberto, is lined with shops and bars. Along the street are people-filled squares that are good for enjoying an outdoor drink and people-watching. One of the best squares is Piazza IX Aprile and offers great sea views. Piazza Vittorio Emanuele: Taormina's tourist office is in the unique Palazzo Corvaja, a mix of Arab, Norman, and Catalan-Gothic architecture. The palazzo also houses the Museum of Contemporary Art in Sicily (closed Mondays). In the square are Santa Caterina Church and remains of a small Roman theater. Piazza del Duomo: A Baroque fountain with a centaur, the symbol of Taormina, is at the center of Piazza del Duomo. The Church of San Nicola, also called the fortress cathedral, was built in 1400 over an older church. It has pink marble columns and interesting carvings. Its main portal was rebuilt in 1636 and features a Renaissance-style rosette. Regional Archaeological Museum: Inside Palazzo Badia Vecchia on a Roman bath site, the museum has pieces from Greek and Roman sites. Medieval Castle and Via Madonna della Rocca: The ruins of a medieval castle are in a picturesque position at the top of Monte Tauro where you'll find outstanding views. There's also a sanctuary from 1640 called Via Madonna della Rocca. Public Gardens: Another good view spot is the public gardens, Via Bagnoli Croce, which features flowers and exotic plants. Beaches: Near Taormina are beaches, coves, and a peaceful sea perfect for swimming. There are paths between the town and the coast. There's also a cable car to Mazzaro, the beach resort just below Taormina, from Via Luigi Pirandello. Buses run to beaches, too. Giardini Naxos: Excavations of the first Greek colony on Sicily can be visited at Giardini Naxos. There's part of a Greek temple and a museum, too. Isola Bella: The beautiful nature reserve of Isola Bella is just south of Taormina. A small finger of land connects the island to the beach below Taormina. Mount Etna: There are many day tours available to Mount Etna. The scenic Circumetnea Railroad circles Mount Etna and stops at several villages. Mount Etna offers good hiking and skiing.